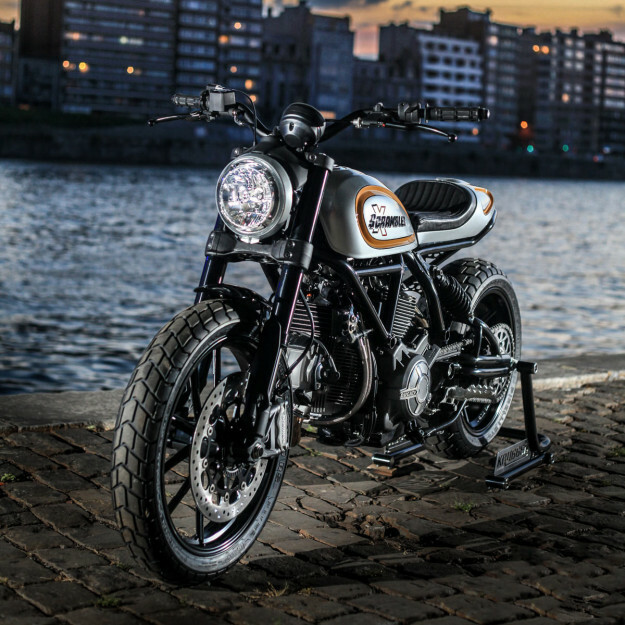 As the Wheels & Waves festival winds down, stunning new custom builds are still being unveiled in Biarritz. 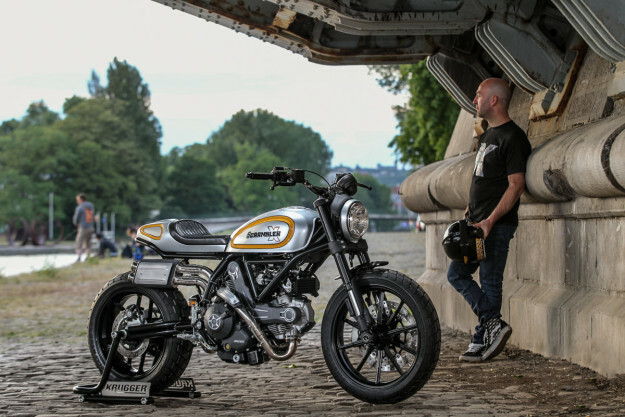 The latest is this Ducati Scrambler called ‘Magione,’ from Belgium’s Fred ‘Krugger‘ Bertrand. Krugger has two AMD World Championship titles to his name, and he’s known for building cleaner-than-factory bikes. He backs up his craftsmanship with amazing attention to detail: this Scrambler is loaded with touches that all but a keen eye would miss. 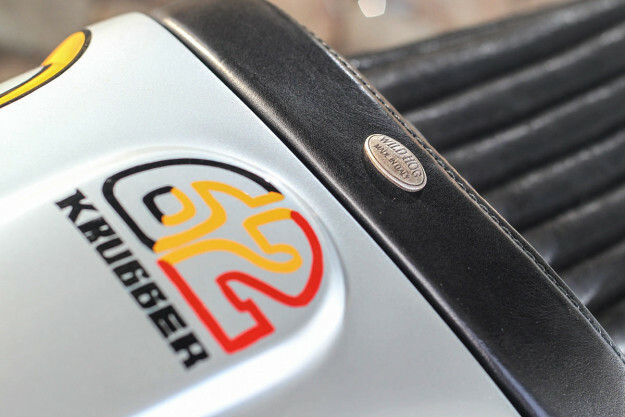 When Ducati handed over the keys, they were happy for Krugger to interpret the design however he saw fit. So he opted to retain the Scrambler’s core vibe—but crank it up to eleven. This meant keeping the original teardrop tank—enhancing rather than replacing it. So he unscrewed the tank’s side panels, cut off the mounting brackets, and smoothed everything off. He’s also tweaked the Scrambler’s stance by dropping the front fork a hair under two inches. Further back is a handmade steel tail unit—mounted on a custom subframe. 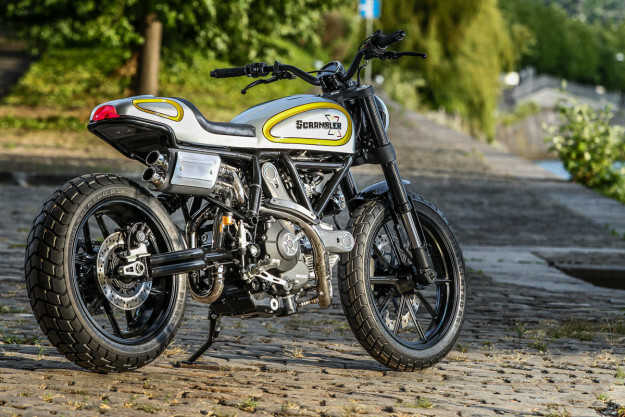 Both the subframe and the tailpiece have cutaways that house the stock Ducati Scrambler LED taillight—which has been inverted. Krugger then shaped a new seat and sent it off to Italian specialists Wild Hog to wrap in black leather. Ducatisti will notice that the prominent swingarm has disappeared. In its place is an exquisite, tubular steel number. 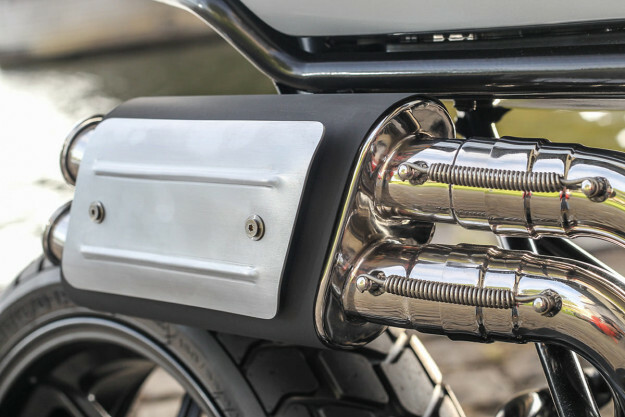 The exhaust system is custom too—crafted from various Ducati headers. 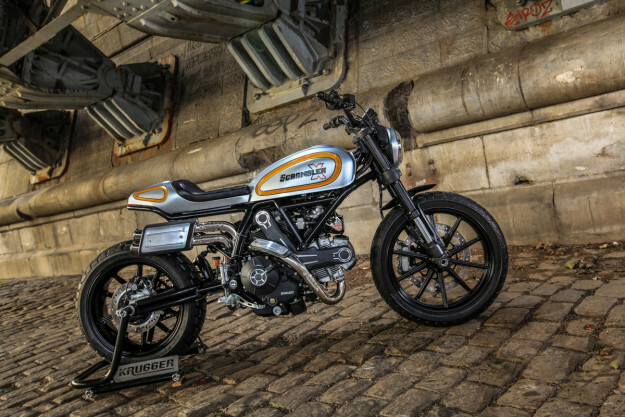 It’s been designed to flow through a gap in the swingarm, and terminates in a handcrafted silencer that we secretly wish is in the Ducati Scrambler accessory catalogue. Krugger’s performed a number of other nip-and-tucks. The oil cooler’s been relocated, the speedo’s now on the left hand side, and the turn signals have been ditched in favor of a pair of bar ends. The handlebars and off-road foot pegs are Scrambler aftermarket items; the latter are rubber-mounted via custom-made brackets. The airbox has been swapped for K&N filters, which involved moving the O2 sensor. Much of the wiring has been concealed—especially up front, where everything’s now running inside the handlebars. Look closely, and you’ll even spot stainless steel safety wire on various bits and pieces throughout the bike. Rounding everything off is a jaw-dropping satin grey paint job, with hand-painted yellow stripes. Amazingly, Krugger wrapped the whole project up in just two months. Some guys have just too much talent. 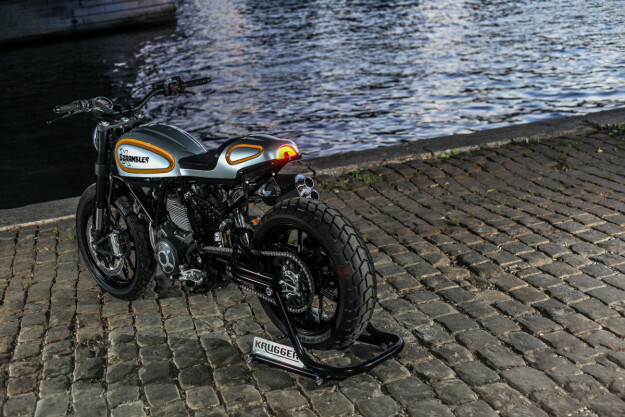 Krugger Motorcycles | Images by Thierry Dricot.